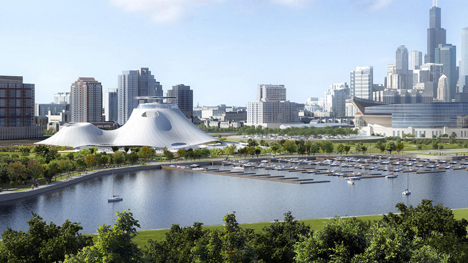 The team led by MAD Architects has presented revised designs for the proposed George Lucas Museum of Narrative Art along Chicago's lakefront (+ slideshow). The controversial project's square footage has been reduced by 25 percent to 300,000-square-feet (91,440 square metres) and its footprint has been cut by 40 percent. 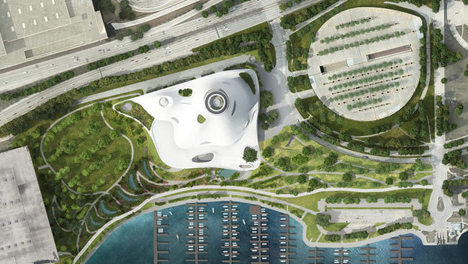 The project has faced lawsuits and criticism from parks advocates for its impact on the lakefront, but was defended by Frank Gehry last year. 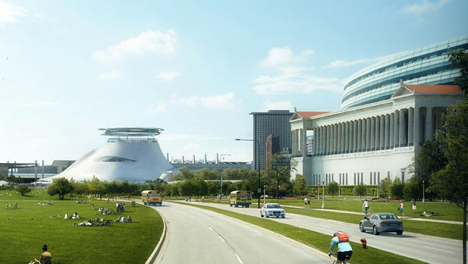 The new design also includes additional windows for views out to the city, Lake Michigan, and surrounding parks. The museum's exterior cladding has yet to be specified, but the architects indicated it will likely be sheathed in stone or concrete. 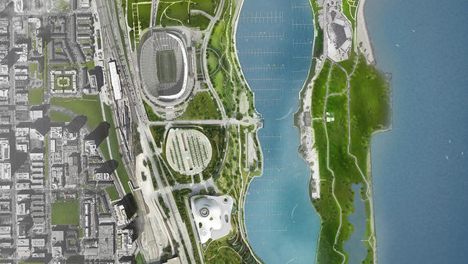 The team also includes local firm Studio Gang as urban designer and New York-based SCAPE as landscape architect. It would be built on what are currently surface parking lots, and plans include a large underground garage to replace those spaces. The revised design adds an additional 4.5-acres (1.82-hectares) of open space, which Studio Gang and SCAPE's Kate Orff are developing into a series of dunes with a filigree of paths and trails running through it. "It's almost like an outside museum. It will be unlike anything in North America now," said Kate Orff, according to Crain's. "We're trying to blur the line between the building and the ground." 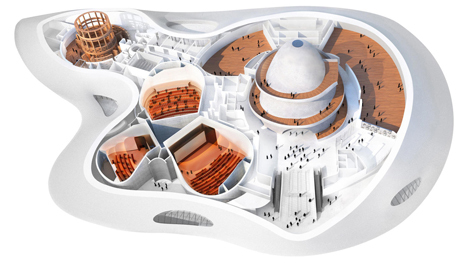 Inside, the building will include galleries, screening rooms, and a restaurant with 360-degree views located at the top of the tent-like structure. 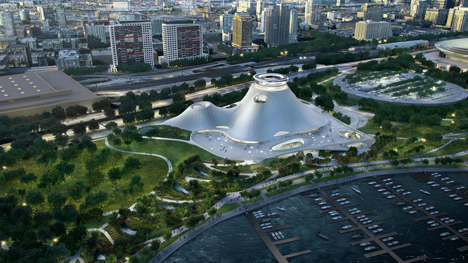 The museum will house the private art and memorabilia collection of the film director George Lucas, who is behind the Star Wars and Indiana Jones movies. The term "narrative art" refers to figurative imagery and storytelling, and the collection includes Norman Rockwell paintings, digital art, and costumes and objects from films. Lucas sold his company LucasFilms to the Disney company in 2012. 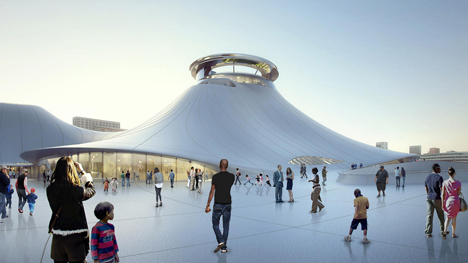 Lucas previously considered building his museum in LA and San Francisco, but run into complications in both cities. His wife, Mellody Hobson, a business executive, is a Chicago native. The revised design will formally be submitted for approval to the city nearly next week. Based in China, MAD Architects is growing its presence in the US after opening an office in Los Angeles. Proposed projects in and around the city include a village-like housing scheme in Beverly Hills and a cluster of linked towers in downtown LA. 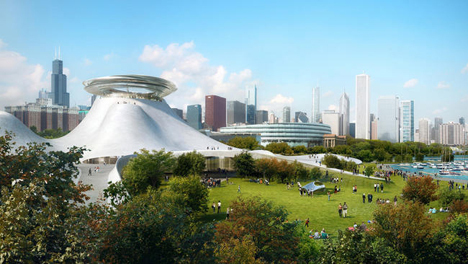 The post MAD Architects unveils slimmed-down design for Lucas Museum in Chicago appeared first on Dezeen.